-Be on the server and in mumble no later than 6:40pm gmt/uk to get things organized. Posted: Sun Apr 05, 2015 6:31 pm Post subject: Re: TriggerHappyGamers Events! Posted: Sun Apr 05, 2015 7:18 pm Post subject: Re: TriggerHappyGamers Events! Posted: Sun Apr 05, 2015 8:27 pm Post subject: Re: TriggerHappyGamers Events! Oh good, it's not on the same night as fight night. I can do boooo....actually...pretend you never heard that. Posted: Mon Apr 06, 2015 12:05 am Post subject: Re: TriggerHappyGamers Events! Great idea, sounds like fun! Unfortunately I can't make it this time but will definitely be up for future events. Great initiative, thanks for organising this MIG! Posted: Mon Apr 06, 2015 11:10 am Post subject: Re: TriggerHappyGamers Events! Yeah great work Mig, hopefully it goes down well and we can find the players in time. Posted: Mon Apr 06, 2015 2:39 pm Post subject: Re: TriggerHappyGamers Events! Yeah sorry about the short notice of 5days guys! should of thought about that. If needed too we can move the date forward some more to give more notice if we don't get all the players by 10th! Future events/match's will most likely be every fortnight, so a weeks notice should be sufficient. Posted: Mon Apr 06, 2015 9:55 pm Post subject: Re: TriggerHappyGamers Events! Posted: Tue Apr 07, 2015 1:05 pm Post subject: Re: TriggerHappyGamers Events! 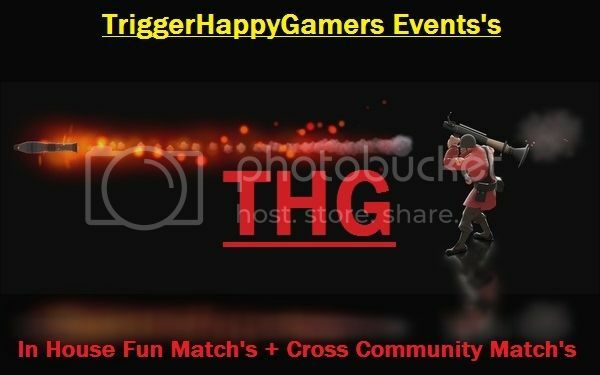 Posted: Tue Apr 07, 2015 9:10 pm Post subject: Re: TriggerHappyGamers Events! Josh you have to be spy, MIG please put him down as spy we want to have fun not go serious. Posted: Wed Apr 08, 2015 9:39 am Post subject: Re: TriggerHappyGamers Events! By that logic, it should be me. Posted: Thu Apr 09, 2015 1:39 pm Post subject: Re: TriggerHappyGamers Events! Any more names down for this event friday 10th, 9v9 doesnt look promising, so 6v6 hopefully! Posted: Thu Apr 09, 2015 4:22 pm Post subject: Re: TriggerHappyGamers Events! I can let you know if I can participate sometime tomorrow. Fridays (and Saturdays) are a bit wonky for me since I don't know if I have to go for work or not or if I plan to go out instead. Posted: Thu Apr 09, 2015 5:26 pm Post subject: Re: TriggerHappyGamers Events! Sorry... i have a BBQ @ a friend Hf! Posted: Fri Apr 10, 2015 10:45 am Post subject: Re: TriggerHappyGamers Events! I have to go to work today, but if I sneak out early I can make it.